JOHANNESBURG – ZIMBABWEANS in the Diaspora have welcomed the new cabinet announced by newly-elected President Emmerson Mnangagwa. They said the smaller 20-member cabinet was representative of all the country’s ten provinces and was well-balanced. Mnangagwa on Friday described his team as “diverse, dynamic, youthful, streamlined and with skills and experience. The leaner cabinet of 20 ministers has been highly commendable as a clear departure from former President Robert Mugabe’s extravagance 35 cabinet mainly composed of cronies, relatives, friends and associates. “Now it is time to get to work,” the Mnangagwa said. 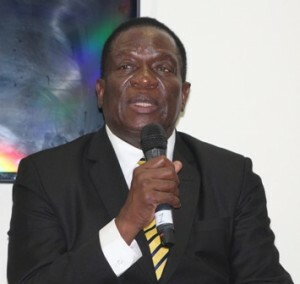 Luke Dzipange Zunga, Global Zimbabwe Diaspora Forum chairman, said the cabinet reduction proved Mnangagwa was keen to minimise government expenditure. “The cabinet reduction shows the president is keen to reduce expenditure by the previous over-bloated cabinet and top heavy government which was responsible for over spending on the national budget,” Zunga said in an interview with CAJ News in Johannesburg. Zunga advocated for a truth and reconciliation exercise to bring closure to violations of the past. He praised Mnangagwa for the increased number of women and the minority whites and Indian races in his cabinet. Olympics legend, Kirsty Coventry, was named in the cabinet as well as Rajeshakumart Modi who was appointed a deputy minister. Global Zimbabwe Diaspora Forum was mostly excited by the appointment of Professor Mthuli Ncube as Minister of Finance and Economic Development. It is anticipated the former African Development Bank (AfDB) deputy president will instill discipline into government spending and eventually help revive an economy that has been comatose over the past decade. The Global Zimbabwe Diaspora forum is a representative of the country’s population scattered around the world mostly after fleeing economic meltdown caused by controversial policies of Mugabe. The current administration has the support of the Diaspora, with the Zimbabwe Diaspora Development Chamber (ZDDC) appointing academic Sox Chikowero to mobilise an estimated 5 million of its members living in neighbouring countries and abroad to converge on issues pertaining to resuscitation. ZDDC is the Global Zimbabwe Diaspora Forum’s economic arm. Mugabe’s government and the Diaspora had strained relations despite the outside-based Zimbabweans driving the economy through remittances. “We (Diasporians) have moved away from anger to reality. Let us work together,” Zunga advised. The Global Zimbabwe Diaspora Forum members are believed to be contributing a whopping $50 billion (about R750 billion) annually back home.